I’d love to say so far, so good, but I’ll say so far, pretty good. I’ve tried to weigh on Tracy’s scale that she [seriously] keeps in the bottom drawer of the bathroom under a tote bag. I’ve weighed everywhere between 139 and 143 each time I stand on the scale one right after the other. To say the least, the scale is inconsistent. I can’t say for sure if any of those numbers were correct, but I’m guessing I’m around 142, judging from the way my pants and ring fit. There’s more food here than I want. Monday night Tracy’s friend brought over dinner. It was a pasta dish with pieces of breaded and fried eggplant. It also had diced tomatoes, something green and a divine seasoning I’ve yet to identify. We’ve also had it for left overs several times and it was as delish then as at first. This morning we had homemade strawberry syrup on top of apple whole wheat pancakes. I hurried and ate an apple and orange so that I wouldn’t be tempted to eat four pancakes in a row! So only two. But the really great thing is, I’ve been strong and been able to resist many other temptations that seem to suddenly be in front of me. For instance, the kids went into Great Harvest yesterday when we were in Idaho Falls. I love Great Harvest. Even when I get a slice of [healthy, 5-ingredient] honey whole wheat I know it’s more than I want to eat because they slice off a hunk the size of Rhode Island and then I usually add the real butter and honey. So it’s just better for me to stay out of there. [Last week when I ran to Utah I had a slice and then had a huge raspberry and white chocolate chip scone which set me off for two days.] When we were all starving we toyed with the idea of going to Subway or another far superior sandwich place in Rigby, Gator Jack’s, but instead decided to go home and eat something already there. On the way we stopped at Maverick for a frozen yogurt for Keziah and I somehow was able to walk out of there without one for myself. Yay! Exercise: This morning I worked on legs, doing 5 sets of hydrants X 20, bridge push-ups, abs on the ball, Pilates for abs and 40 push ups. Yay, again. I hate when people say they don’t have time for exercise. Or worse, when they say they don’t have anything to exercise with. Seriously, exercise with the weight of your own body. 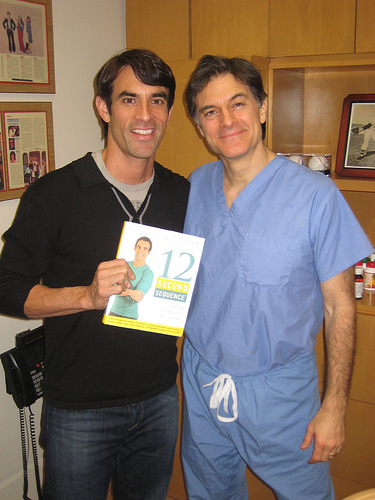 I was just looking for a picture of Jorge’s hydrant exercises for my niece, but found this cool picture instead, of two of my favorite people together. You can’t go wrong listening and living as these two promote. They practice what they preach and are both in fantastic shape and health. Off to making a display for Tracy’s Baby and Pregnancy Fair. Last night she made four darling rice socks for give-aways and today she has lots of work and finishing touches on brochures and signs. So Fish and Annes and I are heading to Gator Jacks, today, for a turkey and avocado and sprout ensemble. Then off to the movies with the girls — Alice in Wonderland. I am so confused……..I think that there is more to losing weight than I figured. I started running on Monday. I ran 3 miles, then 5 miles on Tuesday, then 4 miles on Wednesday. I felt so fabulous that I had decided I’d run 10 miles on Thursday, but my knees had started hurting very badly. By mid-day I decided that if I ran again I might cripple myself–not exactly worth it! I have not exercised Thursday, Friday, or Saturday, and have still lost 1.5-2 pounds. My eating was basically the same as usual. 80-100g carbs/day fresh food, meat, etc. I hate when I get a feeling that I am better off when I don’t exercise (especially when I nearly destroyed my knees!) Now, I have worked my way up to 1 full hour of sweat filled cardio and weight lifting (since December), including a great deal of jumping. But, I have done no exercise for 3 going on 4 days–and my left knee still can’t take any exercise. Frustrating! OK. You need to slow down. Hellooo! You are over-doing! Your knees are telling you that loud and clear. That is way too much. I would stick with one to two miles a day. Now, though, wait until you feel like your knees can take it again. That might be a couple of weeks. I like the walk-run approach. You get a great cardio and it’s actually more beneficial to do the variation method. Called ‘interval training.’ Use the blizzard posts and run one, walk one. You cover more distance. Taking walk breaks allows you to rest and keep going longer, so you burn more calories. You enjoy yourself more. Walk breaks can keep you from getting bored and burned-out. And you are concentrating on the blizzard posts. You recover faster since walking uses different muscles than running; you avoid overuse injuries and recover more quickly from each workout. Your heart gets the better work out, using a quick short sprint and then a restful walk. Breathe in four counts [steps]; breathe out four counts. That’s another way to focus on something else. Keep up the good work! You’re amazing! You’re inspiring! I don’t really need to focus on other things, I love running. But, I do count my steps’ rhythm so I can gauge how fast I am going. I got your weigh-in report, Dorothy, and you did awesome! You went that whole week and maintained, even while traveling, which is very difficult. Thank you for your help, guidance, support, and encouragement. I am glad you like Mondays. I have never exactly loved them.